Looking up the word myth in a dictionary yields several results, including this: a fiction or half-truth, especially one that forms part of an ideology. This suggests that myths do not need debunking, otherwise they would be called facts. The problem is that myths are often presented as facts. Although Jury (2006) did a wonderful job debunking some of the aquarium myths, or “facts” described below, it seems that some of them are quite persistent. This has led us to the present article, in which we scrutinize these myths from a scientific perspective. To cope with this huge excess of (UV) light, both the corals and zooxanthellae use various mechanisms to prevent massive tissue damage. One of the mechanisms used by the coral is the production of mycosporin-like amino acids (MAA’s) and fluorescent proteins (Kinzie 1993; Dunlap and Shick 1998; Salih et al. 2000). MAA’s shield the coral and its zooxanthellae from harmful UV radiation that would otherwise cause major damage to cell membranes and DNA. 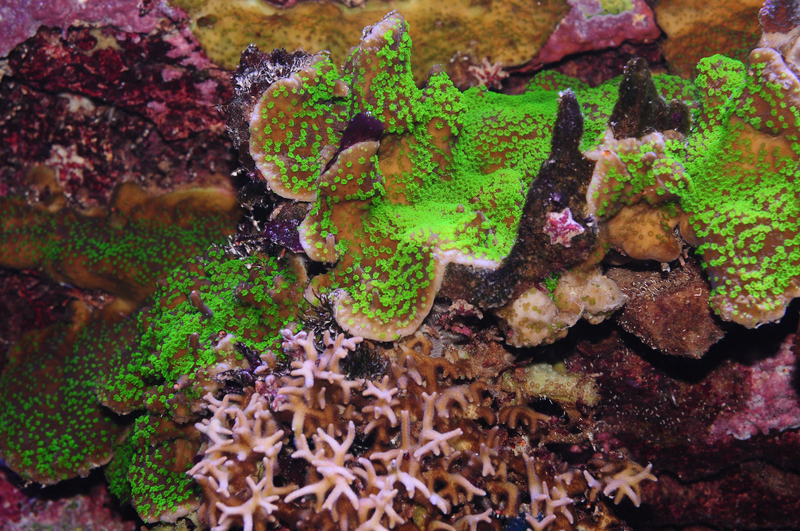 Fluorescent proteins, such as the attractive green fluorescent protein (GFP) which lights up under blue light, is thought to protect the coral against high levels of oxygen radicals produced via photosynthesis (Salih et al. 2000; Bou-Abdallah et al. 2006). Cyan fluorescent proteins may reduce some of the light that zooxanthellae receive for photosynthesis (D’Angelo et al. 2008). Another strategy used by corals is polyp retraction, shading the zooxanthellae from excess light (dimly lit corals usually show increased polyp extension). In addition, the coral skeleton is able to fluoresce UV radiation as yellow light, possibly reducing tissue damage (Reef et al. 2009). The zooxanthellae, in turn, dissipate excess light energy as heat via a complex process known as non-photochemical quenching, and constantly repair their photosynthetic machinery to keep it working (Warner et al. 1999; Jones et al. 2001; Hill et al. 2005). So, to be fair, this first myth is partially true. 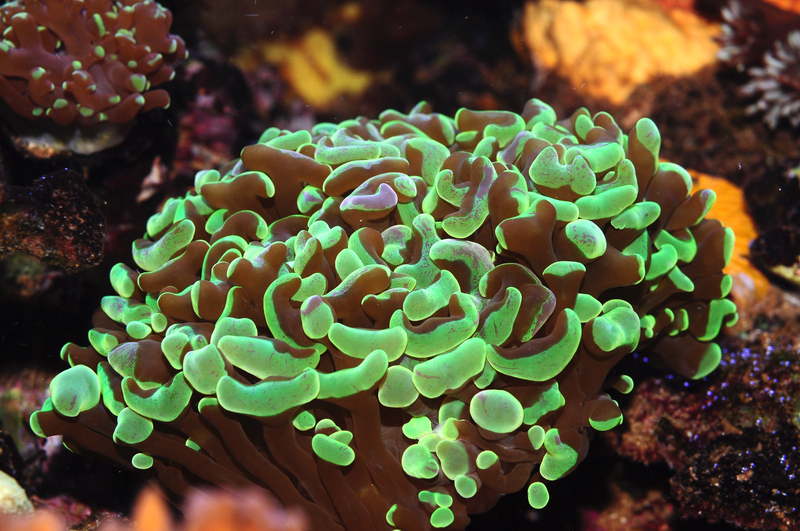 More light can indeed be better for some corals, in terms of photosynthesis and growth, but only up to a certain point. The same goes for inducing coral coloration, as high light intensities are required for the production of several green and red fluorescent proteins, and non-fluorescent chromoproteins (D’Angelo et al. 2008; Wijgerde and Laterveer 2013). However, at higher irradiance, corals show less efficient relative growth (Schutter et al. 2008; Wijgerde and Laterveer 2013), and can become stressed. This is especially true when water flow rate is too low, possibly preventing the coral from releasing excess heat and oxygen produced through photosynthesis (Finelli et al. 2006, 2007; Fabricius et al. 2006; Mass et al. 2010; Jimenez et al. 2011). Thus, we can debunk another, related myth: highly colorful corals are not necessarily the happiest corals, but actually stressed, and have to invest a significant amount of energy into protective mechanisms (including the production of colorful pigments) to prevent light-induced damage. 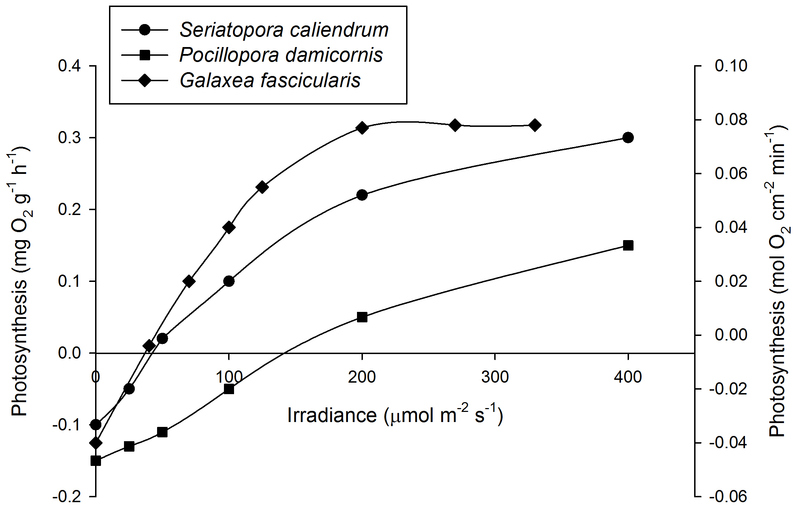 Mean Photosynthesis rates of Seriatopora caliendrum (left axis, N=3), Pocillopora damicornis (left axis, N=3) and Galaxea fascicularis (right axis, N=4)undervarious irradiance levels.At 200 µmol m-2 s-1, photosynthesis has saturated for G. fascicularis. For clarity, error bars have been omitted. Based on Osinga et al. (2011). Specific growth rates of Acropora millepora (N=18) and Montipora aequituberculata (N=18) undervarious irradiance levels. Growth interval was 70 days. 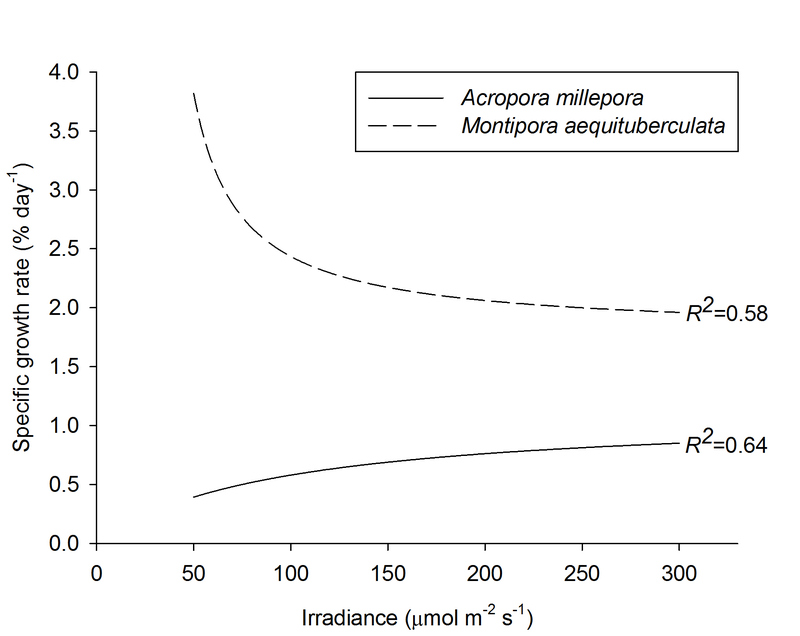 Increasing irradiance beyond 50 µmol m-2 s-1 has a saturating effect on A. millepora, and a growth-inhibiting effect on M. aequituberculata (graph: T. Wijgerde,based on Wijgerde and Laterveer 2013). This myth is clearly linked to the first one, and probably just as persistent. A common phrase, or some version thereof, is: “If you only have soft corals, 100 Watts of lighting power is enough, but if you want to keep stony corals, you will need at least twice that.” When we take a dive on coral reefs, we actually find that the view that stony corals require more light than soft corals has no factual basis. On very shallow reefs, we find both soft and hard corals, growing alongside one another. We see the same when we go deeper, even below 100 meters (333 feet), where both soft and hard corals such as Sarcophyton, Lobophyton, Acropora and Leptoseris spp. are found (Riddle 2007; Bare et al. 2010; Rooney et al. 2010; Bongaerts et al. 2011). These observations are in agreement with laboratory experiments, revealing that soft corals sometimes require more light than stony corals to saturate their photosynthesis rates (Riddle 2007). A Sarcophyton and Acropora colony growing alongside one another at a reef bommie in the Red Sea,Ra’s Qul`an, Egypt. Approximate depth is 3 meters, or 10 feet(image: T. Wijgerde). Although many different lighting types are used above marine aquaria nowadays, most of them have something in common: they emit a significant amount of blue light. 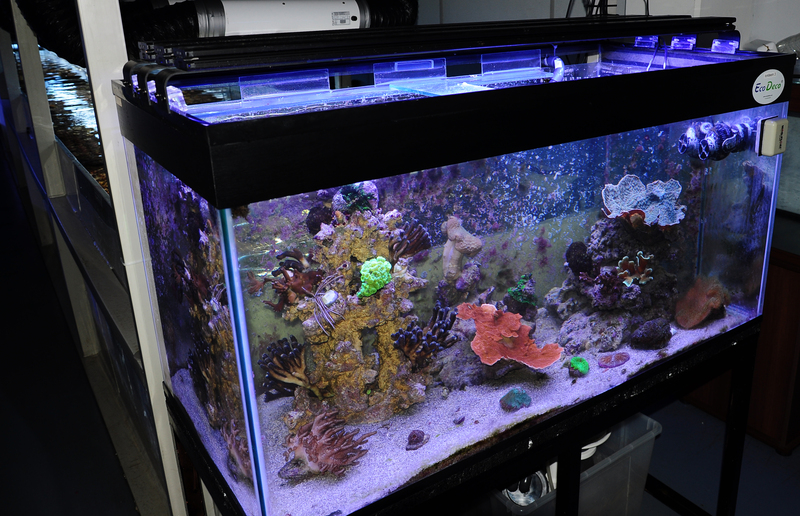 Most hobbyists prefer their marine aquarium to be bathed in blue light, bringing out the fluorescent properties of their invertebrates, whilst their planted freshwater tank receives yellowish light. This blue/yellow dichotomy between marine and fresh water aquaria is believed to be natural, and useful for corals and marine fish. While blue light is certainly aesthetically pleasing, a light source that is skewed toward the blue part of the spectrum is not per se natural, or essential to corals. If we look at how seawater affects the spectral composition of sunlight, we can say that between 0 and approximately 10 meters (33 feet), all colors within the visible light spectrum are present. After 10 meters, however, the amount of red light quickly decreases, leaving the blue-green hue so familiar to divers. 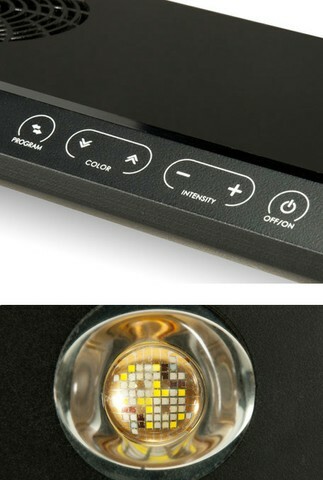 This means that even “yellow” light sources, which emit blue, red and other colors, can be both natural and well-suited for a coral aquarium. It all depends on what part of the water column we would like to recreate. While it is true that some corals prefer blue light, and others seem to benefit from a more balanced light source, in terms of growth rate (Wijgerde and Laterveer 2013), most corals do well under a variety of light spectra. Again, in all fairness, this myth is partially true. Providing corals with more water flow has beneficial effects on growth rates, photosynthesis, respiration, sediment shedding, waste removal and feeding (Wijgerde 2013b). However, “too much” is a concept that also holds true for water flow, as many aquarists know well. 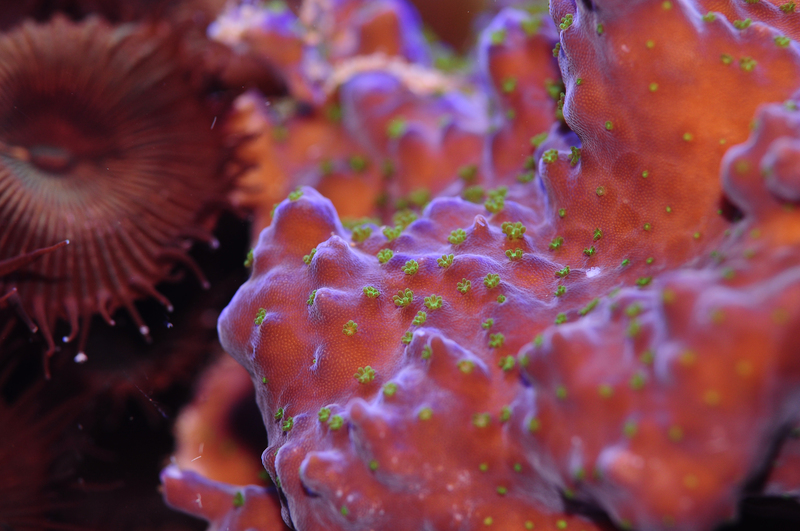 For example, placing corals too close to the outlet of a flow pump can result in serious damage to coral tissue. In addition, when corals experience very high flow rates, their polyps deform to such an extent that feeding on plankton is no longer possible (Dai and Lin 1993; Wijgerde et al. 2012b). To study eutrophication, several studies have elevated the nitrogen concentration to 20 µmol L-1 (equal to 1.24 mg L-1 nitrate). For phosphorous, this elevation often is a concentration of 2-3 µmol L-1 (or up to 0.28 mg L-1 orthophosphate). This increase in nutrient concentrations has been found to have a sublethal, but growth-inhibiting effect on many coral species (Marubini and Davies 1996; Ferrier-Pagès et al. 2000; Tanaka et al. 2007; Hylkema et al. 2014), which is caused by changes in the coral’s physiology. Several theories exist that help explain why eutrophication has a negative effect on coral growth. These include crystal poisoning, where polyphosphate crystals negatively affect coral growth by preventing new skeleton from being formed (Dunn et al. 2012), increased competition between corals and zooxanthellae for bicarbonate and CO2 (Allemand et al. 2004), and reduced release of photosynthates to the corals by zooxanthellae (Falkowski et al. 1993; Stambler 2011). The theory of competition between corals and zooxanthellae for bicarbonate and CO2 is plausible, as zooxanthellae density increases at elevated inorganic nutrient concentrations, requiring more substrate for photosynthesis (Muscatine et al. 1989; Dubinsky et al. 1990; Stambler et al. 1991; Falkowski et al. 1993; Marubini and Davies 1996; Titlyanov et al. 2000). Indeed, bicarbonate supplementation prevents coral growth from being negatively affected by eutrophication (Marubini and Thake 1999). In an effort to find some definitions for the terms SPS and LPS, we mainly came across definitions that only describe the full length of the acronyms. 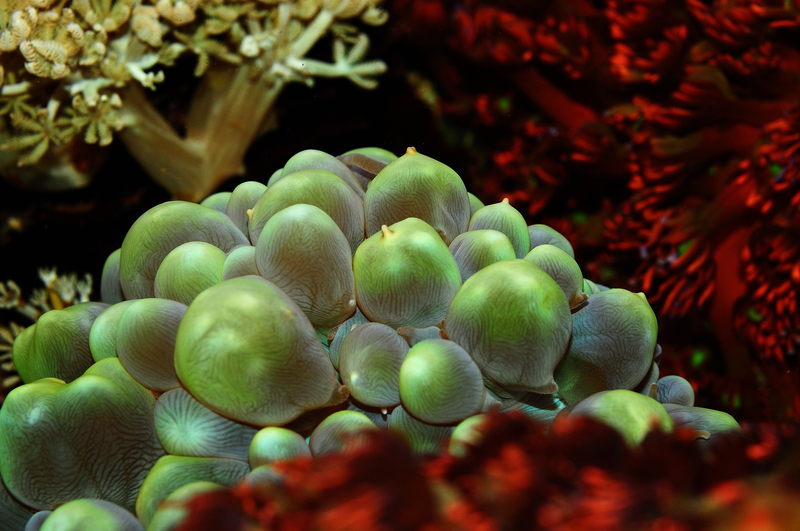 LPS is short for Large Polyp(ed) Stony corals, and SPS stands for Small Polyp(ed) Stony corals. LPS corals are “known” as having thicker, fleshier tissue compared to SPS corals. LPS corals are also stereotyped as easier to keep than SPS corals. The terms are thought to originate from the 1980’s when certain types of corals (LPS) would survive longer, or died more slowly than corals such as Acropora and Montipora spp. (SPS). While we can agree that LPS and SPS can be used to create a dichotomy between corals, the terms lack a properly quantified definition to hold any merit in scientific writing. Both “small” and “large” are subjective terms. In an interview, an experienced aquarist qualified large as anything with a polyp diameter larger than 4 cm (or ~1.5 inches). According to that definition, most genera currently assigned to LPS would no longer be LPS (e.g. Blastomussa, Acanthastrea, Caulastraea), leaving genera such as Fungia, Scolymia and Cynarina. Thus, even a specific size is not sufficient for a good definition as it is highly arbitrary. Studying the detailed morphology of coral skeletons, together with DNA analysis, is the only reliable way to distinguish between species (also see below). In addition, as size is not a good predictor for the environment in which a coral species is found, this characteristic has little value when determining what a coral requires in captivity. Next to using the wrong criteria for identifying corals, the use of popular names for corals and fish has been a source of confusion. Often people only use colloquial names to describe their aquarium inhabitants, thinking it is more practical. However, these colloquial names are only applicable to one specific language, and oftentimes, many synonyms exist. The major issue, however, is that these popular names lack a useful structure, and thus give no indication of the relationship between organisms. For this reason, we urge people to always use the scientific nomenclature, rather than dubious names such as Candy Cane Coral, Bird’s Nest Coral or Spider Sponge. Although coral taxonomy currently is in a state of flux due to new genetic insights, making it more difficult to remember scientific names, it still is more practical than using countless (international) synonyms. Proper use of scientific names is as follows: Genus species, e.g. Acropora millepora (not to be confused with the hydrocoral genus Millepora). The entire name should be written in cursive, with the genus name starting with an upper case and the species name with a lower case. When referring to one or more species within a genus, you can use the abbreviations “sp.” (one species) or “spp.” (multiple species), both of which are not written in cursive. Because scientific names regularly change, we often mention the person and the year in which the name was given, e.g. Stylophora pistillata Esper 1797, either with our without parentheses. Although these Latin names may sound difficult, they are highly practical as they tell us to what extent different corals are related. Humans (Homo sapiens), for instance, belong to the same kingdom as Acropora millepora; true jellyfish (class Scyphozoa) belong to the same phylum; anemones (order Actiniaria) and soft corals (order Alcyonacea) belong to the same class; black corals (order Antipatharia) belong to the same subclass; Fungia corals (family Fungiidae) belong to the same order; Montipora spp. belong to the same family; and finally, the species Acroporahumilis belongs to the same genus. According to this system, it would for example be incorrect to state that the genera Fungia and Acropora belong to the same family, as they belong to the same order only. If the term “group” is used, one can never be wrong because two given coral species will always meet somewhere in the taxonomic tree, although this term is rather vague. 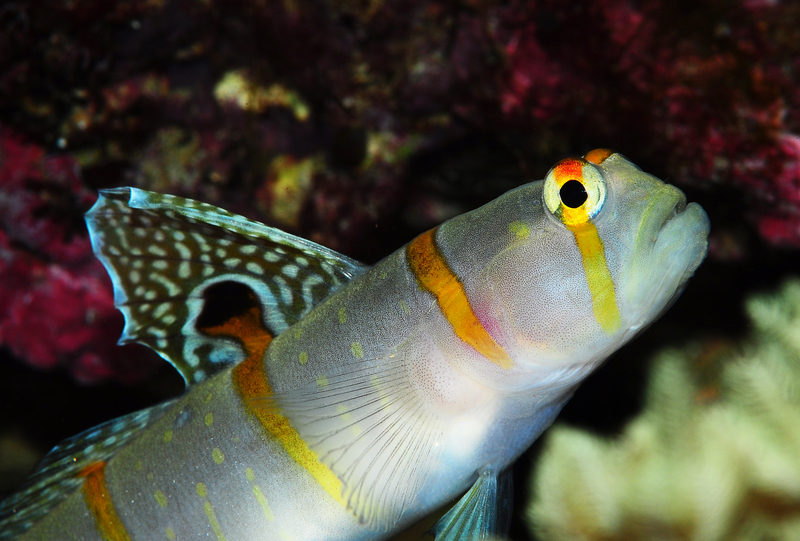 Should we use interchangeable names such as Randall’s Shrimp Goby, Randall’s Prawn Goby and Orange Stripe Prawn Goby, or simply choose one, Amblyeleotris randalli (image: T. Wijgerde)? 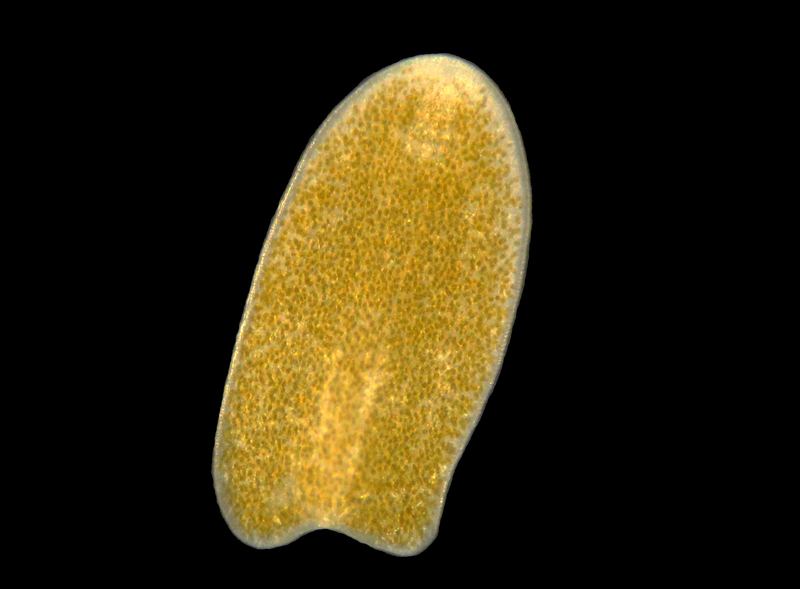 Acoelomorph flatworms lack a body cavity, and digest their prey in a so-called syncytium, a mass of interconnected cells. In aquaria, we find members of the family Convolutidae, within the disputed order Acoela and phylum Acoelomorpha (WoRMS 2013). Species that are regularly found on corals are from the genera Waminoa and Convolutriloba, and they can be distinguished from one another by looking at the posterior end of the worms. This has either two or three lobes, placing the worms in the genus Waminoa and Convolutriloba, respectively. Further identification at species level requires the use of DNA sequencing. Waminoa and Convolutriloba spp. are known to prey on zooplankton (Hendelberg and Åkesson 1988; Shannon and Achatz 2007; Wijgerde et al. 2011), and at least Waminoa spp. 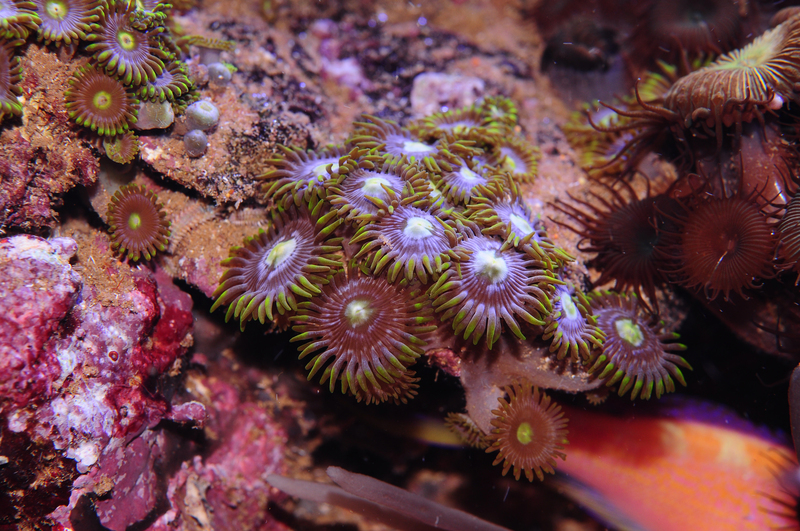 show parasitic behaviour, impairing coral feeding and stealing prey acquired by the host coral (Wijgerde et al. 2012a). Acoelomorph flatworms may be kept under control by introducing natural predators such as wrasses (e.g. Halichoerus spp. ), dragonets (e.g. Synchiropus splendidus) and nudibranchs (Chelidonuravarians) (Carl 2008; Nosratpour 2008). Chemical treatment of corals with the anthelmintic levamisole also works well, but this is impractical for whole aquaria and may negatively affect corals. Polyclad flatworms are quite different, and are placed in the order polycladida, class Turbellaria. The most notorious polyclad flatworm is Amakusaplana acroporae (Prosthiostomidae, Rawlinson 2011), which is known to devour entire Acropora colonies (Nosratpour 2008). In contrast to acoels, which only seem to feed on coral mucus and zooplankton, A. acroporae appears to consume coral tissue. This theory is supported by the presence of nematocytes, cells used by the coral to immobilize prey, in the worm’s digestive tract (Rawlinson 2011). Polyclad flatworms may also be controlled by the predators listed above, and can be removed by spraying them with fresh water (Nosratpour 2008). Possible causes of bleaching are high light exposure (Brown et al. 1994; Le Tissier and Brown 1996), elevated water temperatures (Lesser et al. 2007) and a high concentration of zooxanthellae (Cunning & Baker 2012). Although bleaching is highly stressful to corals, and often leads to their death, corals regularly recover from this. If a bleached coral is re-infected with new zooxanthellae, it can become viable again (Glynn and D’Croz 1990). Sometimes, this leads to a more robust colony than before. If corals are bleached due to elevated water temperatures, they can express what is known as adaptive bleaching. The stressed zooxanthellae are expelled, after which the coral takes up more thermally tolerant zooxanthellae (Baker 2001; Baker et al. 2004; Berkelmans and van Oppen 2006, Mieog et al. 2007; Jones et al. 2008). Often the coral already hosts these thermally tolerant zooxanthellae, but in a low concentration only. Without the competition of the less thermally tolerant zooxanthellae, the more tolerant ones can establish dominance. Adaptive bleaching is yet another example of phenotypic plasticity in corals, and it now is a well-known response to changing environmental conditions. However, Coffroth et al. (2010) suggest this is insufficient adaptation to deal with the effects of future climate change. Interestingly, corals still harbor several types of zooxanthellae after many years in captivity, suggesting that in the aquarium, adaptive bleaching can occur as well (Tilstra 2012; Tilstra et al. 2014). Most dinoflagellates and diatoms are photosynthetic, something they have in common with true plants. Plants are mostly multicellular, while protists are found as single-celled organisms or cell colonies. In addition, protist cells have different cell walls than plants. For example, diatoms are encased in porous silica frustules, which can have all sorts of fascinating shapes. Moreover, protists are motile. Dinoflagellates have whip-like appendages called flagella (hence their name) used for “swimming”, whereas benthic diatoms have what is called a raphe, or seam, for “crawling”. Both protists are known for creating problems in marine aquaria. When conditions are right, they grow explosively and create a thick, unattractive layer coated with oxygen bubbles produced by photosynthesis. Unlike popular belief, dinoflagellates do not require silicates to grow (Tuttle and Loeblich 1975), only diatoms and some other protists do. 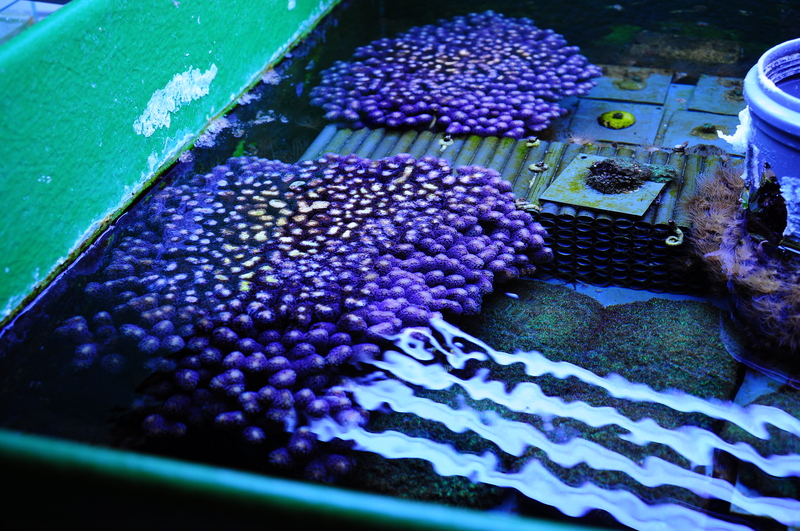 Tim has been working with corals since 2005, starting out in his student dormitory. After obtaining his Bachelor’s and Master’s degrees in biology at Utrecht University, he earned a Ph.D. in marine biology at Wageningen University, for which he studied coral physiology and feeding (image: N. Hurtado). Arjen has been working with corals since 1999, and is now pursuing a Master’s degree in marine biology at the University of Groningen. He recently concluded a study on the effects of climate change on coral growth and physiology (image: A. Tilstra).